Have you ever had a pluot? If not, you're missing out. It's this sweet fruit that is almost like a plum but with a little more bite to it. There are a few different varieties but they're all very similar so they can be used interchangeably. I discovered them last year at the grocery store. I was walking in the produce section when the word 'dinosaur' caught my eye. It's not normally a word you'd see around fruit so I was intrigued. I headed over to the sign and saw a fruit that was green with pink speckles on it. Now, any fruit that has pink dots on it has to make you look twice, right? And it must taste good if it's that pretty, right? Well, it was good. 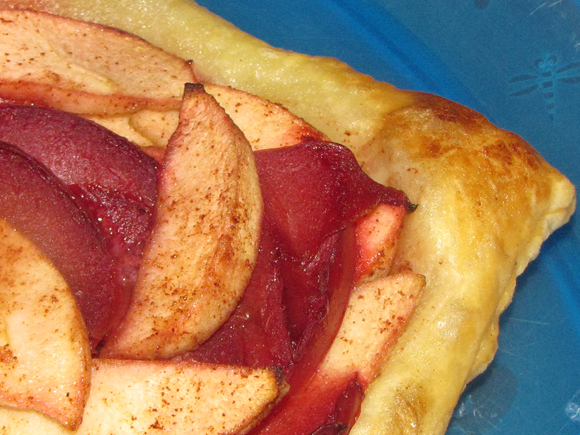 They're great to eat on their own and they're great to use in dishes like this little tart. So be adventurous and try this new fruit if you've never had it before - you won't be disappointed. 2. Unfold pastry on floured surface and cut into 4 equal squares. 5. Spoon fruit mixture evenly over pastry squares. Don't use too much of the juices or else the pastry will get soggy as it cooks. 6. Brush edges with egg wash and sprinkle with extra sugar. 7. Bake for about 20 minutes or until pastry edges are golden brown. 8. Cool completely before serving.